Made for iPhone which allows direct streaming for music and phone calls. Uses algorithms and machine learning to learn your preferences over time and adjust seamlessly. Great performance for music and in difficult listening situations. 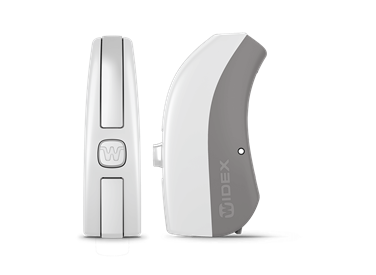 The Widex Evoke hearing aids are the first hearing aids powered by machine learning technology. These hearing aids are suitable for a wide range of hearing loss and feature the natural sound quality that Widex is known for. 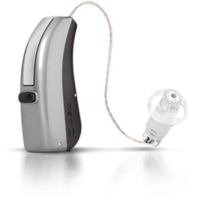 The Evoke range is the first hearing aids which feature the Widex SoundSense technology. Widex SoundSense uses a smartphone app to intuitively personalise your listening experience. The App uses the data which it collects and applies them to similar listening environments you often find yourself in. This is really a step forward in hearing technology and gives users unprecedented control over their settings and experience. The Widex Evoke are especially good for music listeners, by using the fluid sound analyser it can even know the difference between classical and pop music! The Widex Evoke is made for iPhone so you can stream high definition audio directly from your smartphone. The Evoke comes in 4 technology levels and is suitable for a majority of hearing loss and budgets.